Taste test: These are the thick, wide-rippled McCoy's chips with a curry flavor. They're different from most curry chips. 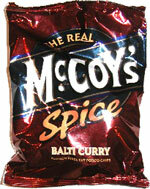 I'm not sure what Balti Curry actually is, but some people who like ordinary curry didn't like these. 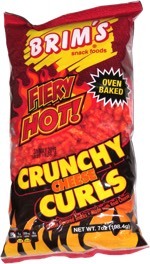 But actually, they're pretty good chips with lots of flavor. Smell test: Good curry smell.